AJ Perez, 18 years old dies young. He was killed in a highway accident in Tarlac early Sunday morning, according to showbiz reporter and columnist Ogie Diaz. 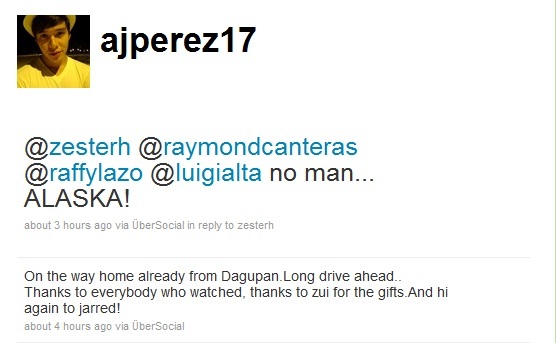 Diaz, who said he has talked to the father of the Star Magic actor, reported that Perez was on his way back to Manila when the van he was in collided with a truck in Taclac. "Galing ng Dagupan, pauwi na. Tulog lahat sa van. Sa Tarlac, biglang bumangga sa trak. Bago pa nadala si AJ Perez sa ospital, wala nang buhay," Tweeted Ogie Twitter account. "Nasa isang clinic sa Paniqui, Tarlac ang mga labi ni AJ Perez. Kausap ko si Daddy kanina, iyak nang iyak. Ndi ako makakatulog nito," added Diaz. Diaz said that the truck rammed the side of the van where the actor was resting. "Bumangga daw yung truck sa side ng van kung saan nandu'n ang ulo ni Aj Perez na natutulog sa byahe pa-Manila sa Paniqui, Tarlac naganap," he said. He died due to multiple head injuries. Officially at 12:20am he died due to multiple head injuries. AJ Perez is a member of ABS-CBN's Star Magic, he was also the lead actor in the recently concluded drama series, "Sabel". confirmed na ni??? knsa mn na xa?? anyways,,my condolence to the family...be strong..
condolence to Perez FamiLy, may Aj rest in peace. YOu will remain in our hearts.